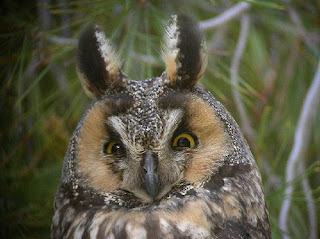 Animal Wildlife | Long-Eared Owl | The long-eared owl is a fairly widespread bird, found throughout Europe, North America and parts of Asia, where it spends the warmer summer months breeding. Like all migratory birds, the long-eared owl migrates south during the winter months, before returning north when the weather warms again the spring. 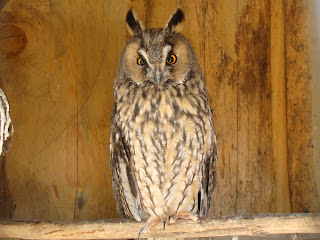 The long-eared owl is a small species of owl that is primarily found in parts of the Northern Hemisphere. As it's name suggests, the long-eared owl is named after the long, black ear-tufts, which are feathers found on either side of the middle of the long-eared owl's head. The two most of distinctive features of the long-eared owl are it's black ear-tufts and the reddish/brown disks that are marked around it's eyes and are characteristic of this species. The long ear-tufts of the long-eared owl are mainly used to make the long-eared owl look larger than it really is to other animals, when it is perched in the trees. Long-eared owls are nocturnal meaning that they are most active under the cover of night. In a similar way to other owl species, the long-eared owls are generally solitary animals that are only really seen together during the mating season, or small groups of long-eared owls are sometimes spotted migrating to the warmer south together. Long-eared owls are carnivorous birds, only hunting and feeding on other animals in order to survive. 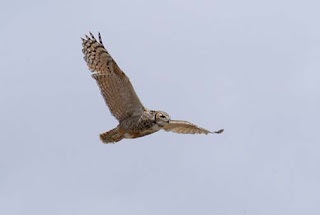 Small mammals such as mice and voles are the most common prey for the long-eared owl along with smaller birds and reptiles. Owls do not chew their food but instead swallow it whole, regurgitating the bones in a small pellet some time later. The long-eared owl has few ground-dwelling predators as it is only really seen at ground level when swooping down from the sky to catch it's dinner. Airborne predators are the biggest threat to the long-eared owl, particularly large birds of prey such as bigger owls and eagles. 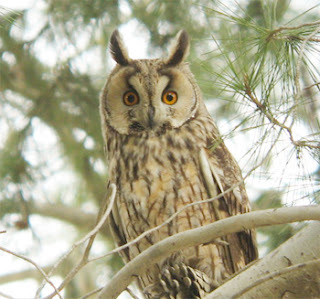 Long-eared owls breed in the warmer spring months between February and July, often nesting in the trees, occupying nests previously built and abandoned by other large birds. The female long-eared owl lays around 5 small eggs which she sits on (incubating them) for up to a month. Today, the long-eared owl is becoming more threatened in the wild, with population demise primarily caused by habitat loss across much of their native range, and the decreasing amount of rodents for the long-eared owls to feast on. 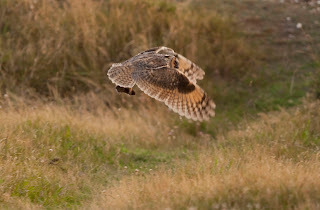 0 Response to "Long-Eared Owl"